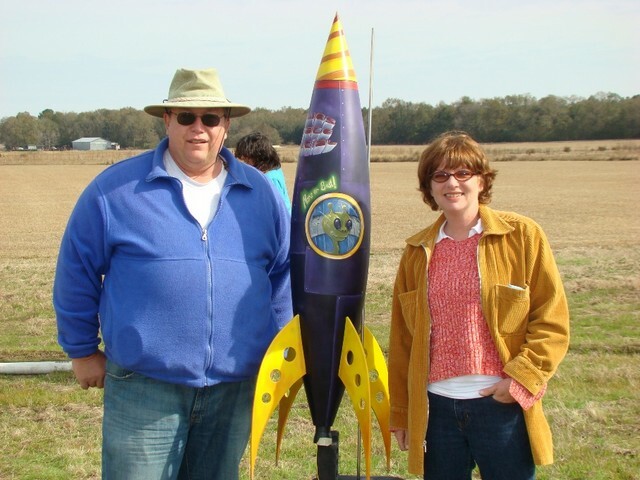 The next SouthEast Alabama Rocketry Society (SEARS) launch is February 2nd 2008 in Samson, AL. Our event is Egg Loft Day. Use a green flight card for any egg loft flight and you will entered for a draw from the prize pool. We will also have Egg Loft Duration contest for 18mm C motor egg lofters. The rocket bearing one raw large egg must come down as one piece and the egg must not crack. This contest is for bragging rights and a mention in the launch report. We are announcing an on-going Young Rocketeer Event for any person twelve or under. Make a launch on a blue flight card and you will be entered for a draw from the prize pool. Please let the young rocketeer do as much as possible in building and launching of the rocket. SEARS 572 had its monthly launch in Samson, AL on Jan 5, 2008. The day started out cool, but warmed to the upper 60s in the afternoon. The winds were mainly light. They got up to about 10 mph around noon, but fell as the day wound down. The day was one of the biggest attended in SEARS history. There were 18 vehicles at the launch. The totals were 18 fliers and 102 flights. Many came to see the flight of the “Hewes Space Special”. The maiden flight was not great, as the rocket nosed in. John says it is repairable. You are currently browsing the SouthEast Alabama Rocketry Society weblog archives for January, 2008.